The two main stories of the summer at the box office continue to be the amazing success of Spider-Man - beyond nearly all expectations - and the surprising failure of the latest Star Wars movie to duplicate or exceed that. However, with a franchise at stake, The Sum of All Fears hopes to become another story by being the film to take away Star Wars' top spot in the weekly totals. It's the film with the best opportunity to do so, but there is a wild card this weekend; the sleeper potential of Undercover Brother makes it a possible, if unlikely, challenger for the crown. Historical revisionists could learn a thing or two from the Jack Ryan series; in just four films, there have been three actors to portray the main character (This falls short of the five actors who have played Anakin Skywalker/Darth Vader, and of course the five James Bonds). Not only that, but with the switch to a much younger actor, the timeline has been rewritten, with the events of the other three films shifted out of any kind of chronological sense. The Tom Clancy books are popular enough that there'll be little confusion about the relationship to the rest of the series, but can Ben Affleck be a suitable replacement for Harrison Ford? The true fact of the matter is that none of the Jack Ryan movies have been phenomenal hits off the block. All three titles, when adjusted for inflation, end up in the low- to mid-20s of millions. Added to that, the first installment starring Ford is actually the lowest grossing of the bunch. 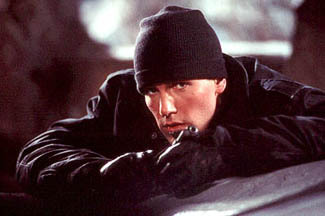 Ben Affleck may be an interesting shot-in-the-arm for the series, although his record as an action star is somewhat spotty. Phantoms and Reindeer Games nearly killed his career, and although he has the twin $200 million pictures of Armageddon and Pearl Harbor (yes, Pearl Harbor fell $2 million short. Do you split all your hairs? ), very little of the credit for either film's success goes to him. Good Will Hunting 2 was looking like a real possibility, instead of a joke from a Kevin Smith film. The success of Changing Lanes despite a terrible ad campaign shows that there may be something to him as a box-office draw after all, though, and aside from cries of "heretic" from bitter Harrison Ford fans, Affleck is a natural for this "non-action" action role. The only thing that prevents me from predicting a tremendous breakout for Sum of All Fears is that the series has never been that hot in the first place. Questions have arisen regarding the palatability of the material in this post-terrorism world, but quite frankly, and without being callous, this can only help. The White House may question the release, but this brand of movie isn't going to go away. Paramount's release strategy is a super-wide 3,100+ venues, which should allow the film to surpass the franchise history of medium-sized performances with an approximately $30 million take. Undercover Brother looks like it could have been a Wayans Brothers film, and I think we can all be relieved that it didn't end up being one, even if you have no plans of seeing it. This parody looks like someone added bits of Austin Powers and I'm Gonna Git You Sucka (made before the Wayans lost that last drop of credibility) to a blender and hit purée. It's got one of the funniest trailers and marketing campaigns of the year, so that the film doesn't rest entirely on the relatively-untested shoulders of Eddie Griffin. Griffin was the funniest thing about this month's The New Guy, which doesn't look like much at first glance but trust me; it's more of a compliment than it sounds. This isn't the first time he's stolen a film in five minutes, as he was far funnier than anything that Deuce Bigalow deserved. As Austin Powers has shown, these kinds of things can lead to a franchise...eventually. Even with its brilliant concept and inspired casting, it's going to need a couple of weeks to ferment, perhaps even waiting until video. Its producers are confident, though, with a sequel already being planned. A $16 million weekend is certainly possible here, which could build enough of a base for future films. It must be hard not to feel like chopped liver at Lucasfilm. After all, they just had a film reach $200 million in only 12 days, yet it's starting to be viewed as a disappointment. They're already feeling the pinch, as not only did Attack of the Clones fail to duplicate its opening weekend on Memorial Day weekend, it dropped below the performance of The Phantom Menace for the same weekend. Ads are aping the Spider-Man campaign, which is tantamount to conceding its spot as the number-one film to see. It's crystal clear that it won't increase on the final total of Episode I, and it may fall well short of this mark. It's a crucial weekend for Clones, which could salvage a lot with a $30 million weekend. I don't think this will happen, although let's put this in perspective; it's still going to end up in the top ten films of all time at the end of its run. It's just not going to be in the top five. Spider-Man officially entered the top ten after last weekend, the first time a Sony/Columbia film has been there since Ghostbusters was bumped out in 1994. With the $100, $200 and $300 million speed records under its belt, it now sets its sights on the $400 million record, invoking the name of Titanic to do so. With over a month to go to make this mark, I have little doubt this is going to happen; it's going to have a total of about $360 million after the end of this weekend. Let's not get carried away, though; there's zero chance at this point of it cracking $600 million, and only a slim one for $500 million. This film clearly breaks the thinking that had popped up surrounding most blockbuster films in the past five years. None of the big openers could withstand competition past a second weekend; they simply didn't have the fan base, dropping 45% or more. As the largest opener of all time, surely this was going to be exacerbated. Instead, it's gone on to gain steam, sucking up the air around other potentially weak films like a boa. This simply goes to show that when dedication meets skill, great things are possible. Insomnia was the best story of the three new Memorial Day films, earning a $26.1 million figure in four days. Reviews have been excellent, praising mostly the acting but also giving credit to the atmospheric direction. With a strong weekend of over $15 million this weekend, it could end up with a $100 million final figure. Spirit: The Stallion of the Cimarron will likely be the film to carry over best of the three, as it was not only the best received by audiences (as judged by CinemaScore), it has schools letting out, with tykes who have lots of time on their hand. I would not be terribly surprised to see it also reach the $15 million mark. Enough should fare the worst of the three, but not as poorly as could be expected (hoped?). Lopez's revenge fantasy was received better by females than males (no, really? ), and audience targeting is an easy way of capturing a market niche. With about $10 million this weekend, it will move closer to an eventual $60-70 million total.